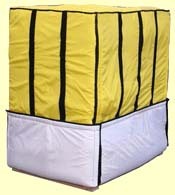 We supply and manufacture thermally insulated palletised produce covers for commercial applications. Bespoke covers can be produced to customers specifications. Please contact us directly for further information or for a quotation. Illustration is of a tailored thermally insulated cover in reinforced PVC to fit a standard pallet of 1000x1200 at 1500mm high. 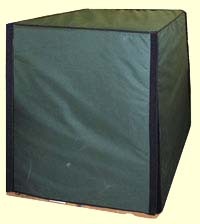 The front face is “Velcroed” in position and can be flapped up to access the contents without removing the whole cover. Our standard thermally insulated pallet covers come in 2 sizes, 800 x 1200 and 1000 x 1200 Both sizes are adjustable up to 1800mm and provide outstanding thermal protection and insulation.